Converting RSS news to Email can be useful for users who prefer to receive information about updates of their favorite sites in their inbox. It also comes in handy when using mobile devices because it is usually easier to read the news in an email client instead of having to read them in a web feed reader. RSS FWD (discovered at Donation Coder) is a service that can turn RSS news into emails. The service provides an easy to use interface. It works by entering the main url of the website in the form on the main page which is convenient for many users who do not like to search for the RSS news link on a website or do not know what RSS actually is. The service will automatically discover the RSS news feed - if there is any - and display a preview of the latest items. The user has to sign up afterwards by providing an email address and password which will be used to login to the service and manage the subscriptions. The interval of the updates can be selected during the subscription. It is possible to select real-time, daily or weekly updates in the inbox. Users with many RSS news feeds can import an opml file so that all feeds contained within will be automatically added to it. Webmasters can make use of small pieces of code they can place on their websites to allow email subscriptions. Each email send out will contain an unsubscribe link which can be accessed to unsubscribe from the website. 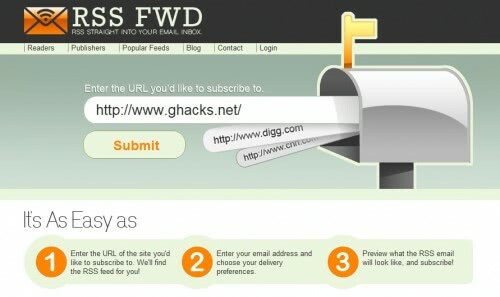 It is also possible to manage subscriptions directly on the RSS FWD website. I’m curious Martin – do you have any statistics on how many (or what percentage) of your readers access your posts via RSS vs. other methods? I read ghacks in RSS form. It comes in to Outlook. From there, I sometimes forward stuff. Outlook does the job fine. I’m pretty sure I’ve done it with Thunderbird too. As for which % of readers consume blogs via RSS, I think it’s a no brainer. It doesn’t cost anything to provide RSS and you can use services like feedburner to get real good insight into who reads your blog (via RSS). RSS Fwd was a lot better before, individual emails for each blog update. Now they group things together so you may get 10-40 entries in a single email. If you want to save certain ones or scan through titles quickly, this is not the service to use. Unfortunately, who ever bought them do not respond to emails any longer either. RSSFWD doesn’t work anymore. Are there any other sites? thats sites its blog wordpress, where is rssfwd?